What I am creating is a small “Thing”, you can hold it on your palm. But, I strongly believe you can feel something right after you open the box. In this box, it is filled with all the essence such as Technology, Knowledge, Experience, Know-How and concept of value. And they are not belonged to only myself. They are the essence of Technology, Knowledge, and experience what I have inherited from technicians and players. Also, they are the blood sweat and tears of Know-How and concept of value what I have studied from master of experienced craftsman in Japan. Electric Guitar can finally make sound after plug in to amplifier. Then, it becomes music instrument. Music instrument must be conveyed player’s will and “Voice” perfectly. For electric guitar, pedals are also tools and music instruments in order to finalize player’s voice. 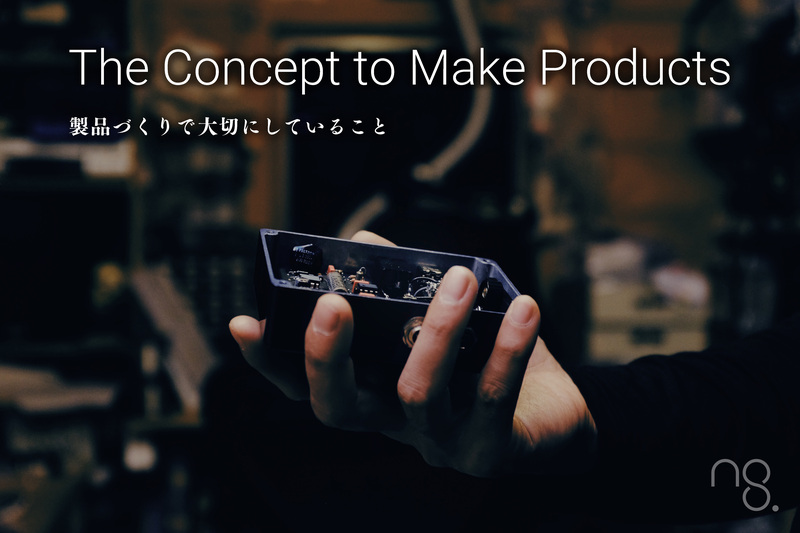 Builders for creating pedals become the core of persons who inspire the music world with pursuing the player’s voice, embodying, and presenting as the master of experienced craftsman. Body, wires, parts, everything influences to the sound. The result what I selected, and what I compromised is most obvious to the sound. It should be modified, but too much modification is not good. For such balancing needs experience, decisiveness and sense, that makes difference of each pedal builder. What I am most experienced is taking care of vintage parts. Because I am experienced of vintage parts, I can select the best one to the best place effectively. To tell you for not making misunderstanding, vintage parts or expensive ones are not always the best, and present parts or cheaper ones may not be the worst. Regardless in the past or at the present, not only parts or anything, the best is the best and the worst is the worst. That is all. Beautiful appearance is also important for gear. Even though the machining precision at external appearance is not so good, and soldering looks sloppy, these are not influenced electrically. But, I believe looks beautiful one makes beautiful sound, so I want to have high precision machining and to make finish soldering beautiful. In order to withdraw the maximum attractiveness and potential, I always keep in mind to create give someone a impression of “It makes beautiful” with appearance, circuit board and overall manufacturing. For instance, I select fragile parts like Jack and Switch from highly reliable manufacturers, and also I put high priority to the reliability so to select high durability and long lifetime ones even though become expensive. My policy, it must avoid any kind of cost down for giving influence to the reliability of my pedal, which might stop playing because of its trouble. The core of my work is not enough to complete each pedal, but is supporting player’s performance with do all I can. The pedal must be a tough gear. For instance, master of hammer blacksmith, he produces it becomes a part of hand of carpenter. And, that master of carpenter builds better house for his precious owner withdrawing the full hammer performance, don’t you think? Me too. I produce my pedal useful to your play, and I am willing to entrust my pedal to players with my best wish “I want to back up your performance with do all I can”. It is you, actually playing and feeling my pedal, who making final decision whether my pedal can or cannot be useful. I must be facing seriously to anything of music, because I have been saved by music many times in my life. I cannot show you another way of my respect and affection to music except like this one. I may sound superior, but I am facing each one by one honestly, and I obviously should produce my pedal with my blood sweat and tears that are obvious. It is my pleasure if you would have a chance to select and try my pedal, because I produce it can withstand of your evaluation as the one of the best pedal from among of stars. And I sincerely wish if you could play with my pedal and play the best performance to your audience, —— I, as one of a master of pedal craftsman, feel more blessing than I deserve. Please let everyone to hear your fabulous phrase.